The house feels so empty now that we’ve packed up all the Christmas decorations. The spot where the tree stood seems so plain now. It was kind of sad having to store everything up in the attic knowing it will sit there a whole year until next Christmas. I did manage to keep some things out in hopes using them for winter and future holidays. Although the holiday season is fun for me, my most favorite day of the year is the day after Christmas. And no, not because it means the stressful time is over– but because I get to go shopping and take advantage of all the deep discounts. This time around I snagged a great buy online. I’m looking forward to next Christmas when I get to decorate and hang my new Advent Calendar. This burlap sack design hangs easily and has pockets ready to be filled with “treats and other seasonal surprises”. I especially like that each number is silk-screened in a different font/typestyle. This piece is earthy and yet well designed to dress up any wall for 25 days, starting December 1st. You can find it at Pottern Barn as an online exclusive. Now with Christmas past us, it’s time to look ahead to the next big holiday… Valentine’s Day, February 14th. I love that there is a day to commemorate love and affection. Love needs to be celebrated! We should all take the time out of our busy lives to tell our friends and family how much they mean to us. It shouldn’t take a holiday to make us do this but at least it reminds us. And it’s such a shame that handwritten notes have largely given way to mass-produced greeting cards. I’ll be designing some cute cards to mail out to all those special to me. By doing so, I hope to inspire others to send out messages of love. And not just storebought sentiments! Handmade/DIY are the best kind and really show that you care. 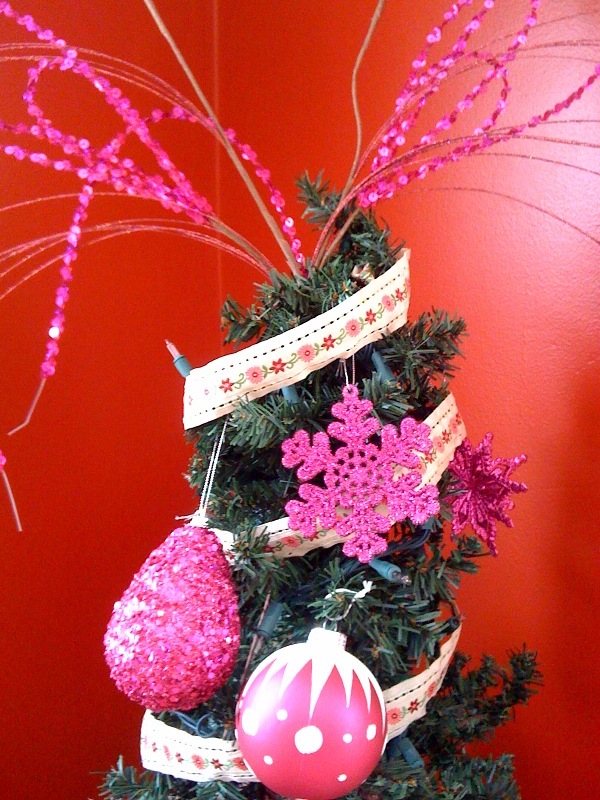 I’ve also decorated a couple little trees in the dining room– covered in ribbon and pretty in pink; and a black mini tree in the guest room with red and silver (candy and snowflakes theme).